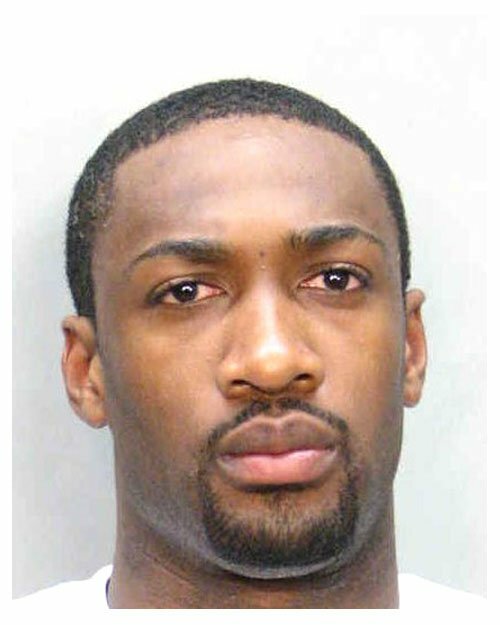 NBA superstar Agent Zero (real name: Gilbert Arenas) was busted by Miami Beach cops in May 2006 and charged with resisting an officer without violence. According to police, Gilbert the Great got out of his limo to check on a Washington Wizards teammate (Awvee Storey) who was being arrested for blocking traffic. The Hibachi then allegedly ignored an officer who told him to get back in his vehicle, prompting his arrest. After being transported to the Miami-Dade County jail, the East Coast Assassin posed for the below mug shot. Prosecutors eventually dropped the charge after The Black President made a $250 donation to a police charitable fund.